The KEY to deciding to prescribe orthotics or not is through a thorough assessment of the entire lower quadrant from the low back down to the toes to find the true cause of the foot pain. 1 – Dysfunction in the low back – can manifest itself in foot dysfunction and pain. Stiffness in the joints of the back can affect the nerve roots that supply the muscles of the foot. This can be completely painless in the low back but the pinched nerve can cause weakness and lead to flattening of the arch or improper gait both of which can lead to common foot pain such as plantar fasciitis, or metatarsalgia/stress fractures of the bones of the foot. In such cases orthotics may be temporarily required to take the load off the foot. However treatment would be incomplete if the spinal problem is not addressed. Once the pressure on the nerve has been resolved and the strength regained the temporary orthotics can be removed. 2 – Dysfunction in the lower limb – movement of our limb should progress in a balanced flow from our pelvis to our foot. Dysfunction in the hip and or knee joint can be compensated for in the foot. When tightness of the muscles exist stretching is required. Temporary orthotics may be used for short term relief. 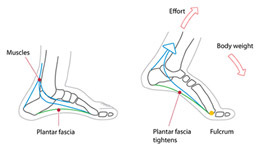 Dysfunction in the foot itself – the foot is a series of bones that move in a coordinated way to allow pronation and supination (flattening and arching) of the foot with gait. 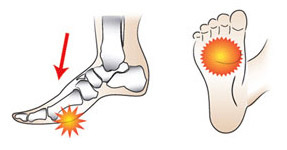 When dysfunction is in the foot itself orthotics are required. In such a case, the orthotics would be used on a more permanent basis. In some cases over the counter orthotics may be all that is required. Properly fitted or custom made orthotics can provide shock absorption, allow the foot to distribute forces through the lower limb and provide a stable base of support for the body. At Vista Place Physiotherapy & Sports Injury Centre we will do a thorough assessment of the lower quadrant as well as the foot itself. We can provide temporary and permanent orthotics for you. If you have any questions regarding orthotics please call 253-2165.